【RAIN HIGH FLOW 】-- Larger 4.7'' surface with more spray nozzles, when the water flow is adequate at home,the shower head handheld can create a relaxing rainfall and waterfall experience for full body coverage. 【HIGH QUALITY MATERIAL 】-- Designed for high water pressure environment and made from high quality ABS Engineering Plastics, the spray nozzles can withstand powerful water pressure. Even if the water pressure in your area is low, you'll still get consistently good pressure from the shower head. 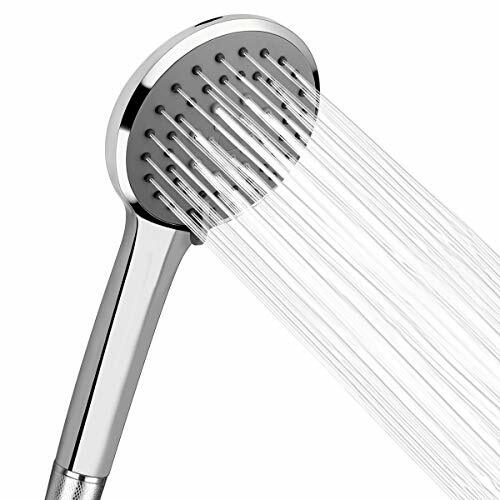 【EASY TO USE 】-- Shower head handheld with three spray patterns (rain, mist, massage), which can function just like a fixed showerhead or be removed from mount and directed onto particular body parts. Perfect for cleaning the bathroom, bathing children and washing pets. 【EASY INSTALLATION 】-- Installs this shower head handheld and connects to universal G1/2 shower hose just for few minutes,without plumbers or tools. 【WARRANTY 】 -- Limited Lifetime Warranty for all our WarmSpray shower heads with handheld,if you have any dissatisfaction about our showerheads handheld showers, welcome feel free to contact us via Amazon. How Old Is Your Shower Head? If yours has been hanging around the stall a while, it's time for an upgrade. Maybe You've gotten used to your plain old shower and don't know how a great powerful shower can improve mood, relieve tension, massage away aches, and more.